We are now on our 3rd snow day. Lots of fun and a little work. I had fun making a stitched scarf last night. Everything but the stabilizer is recycled . I took my yarn scraps, layed them down on a long piece of water soluble Solvy, made a little sandwich and stitched away. Start to finish was probably about 3 hours but easy. 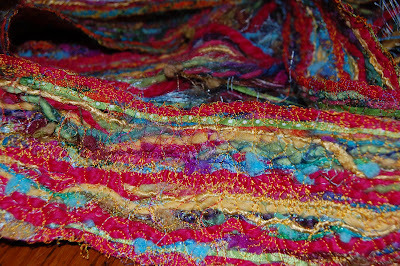 One of the girls in my Fiber Arts group brought one in last week and I was intrigued by it. Now, this isn’t a new idea and it resurfaces every once in awhile but I hadn’t tried it. 1. Water soluble Solvy can be found at your local craft stores by the stabilizers. Use that coupon! 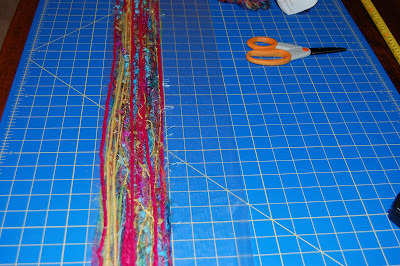 I measured my length, laid it out and folded it over the yarn like a sandwich. I think I can make three from the package- at 4$ per scarf. 3. Sew the edges first. 4. 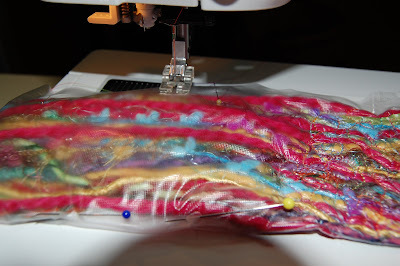 Sew horizontally and vertically- I used free motion stitching and some decorative stitches on my machine. 5. If you have a single needle throat plate that would help too- I don’t for this machine yet. 6.I used bits of ribbon too. I don’t like how it feels though with the yarn. 7. I used rayon thread which is a bit stiff. I would use cotton next time to make it softer and not as much yarn- more wispy. All in all, great fun for a last minute gift. I need four of them and thank goodness it worked! 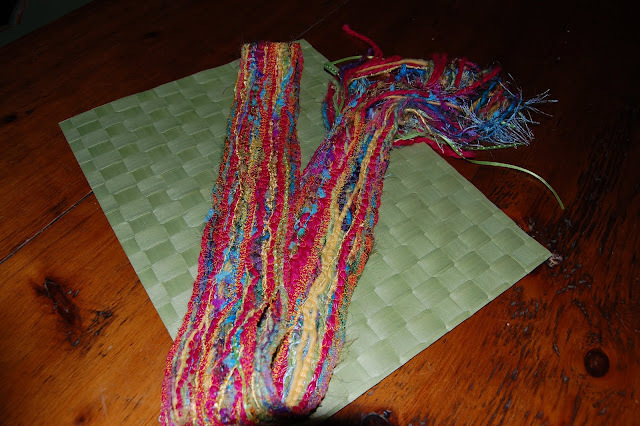 This entry was posted in Stitched scarf on December 11, 2009 by Colleen Kole.